No matter which school you follow in cryptoanalysis, what's happening with bitcoin right now may be causing a lot of frustration and anxiety. It hard to tell where it's going. Bitcoin's price chart used to be very predictable and decisive but with the entrance of institutional investors, it has become a game of dice, highly unpredictable. 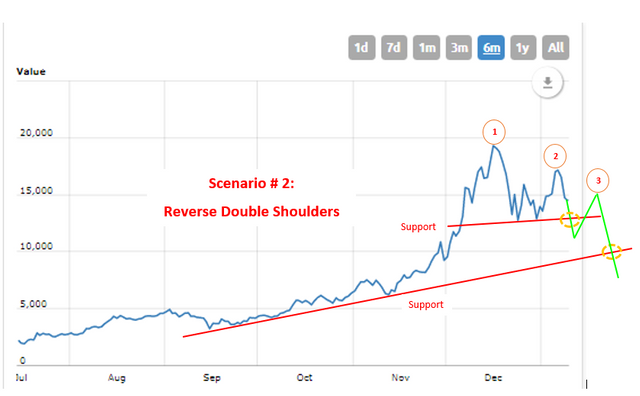 Under this formation, there are two requisites for the bullish trend to continue: (1) the next upward move should cross the neckline as represented by the lower orange circle below; and (2) the top of the next upward move should be higher than the all-time-high (ATH) which was at around $19,600. One possible variation in this formation is for the next upward move to cross the neckline but fall short of exceeding the ATH. 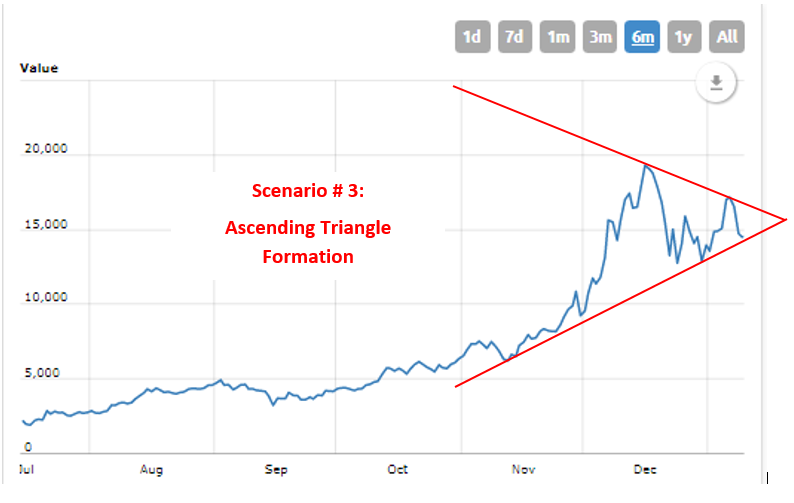 However, the next wave of uptrend should exceed the ATH. If this does not happen, this will open another round of possibilities including double top and a bearish run below the previous low of $11,600 (see scenario # 2 below). Similar to number 1 above, the one requisite to confirm the bearish trend is for the next downward move to cross the first support line as represented by the upper orange circle. And if the next downward wave crosses the second support line, then we are in big trouble - too late to sell, and we gonna look at our investments being mutilated day by day by day until the short sellers decide to rake in their profits and reverse the trend. The one thing that really scares me is the 1, 2, 3 downward top formation. I hope this does not happen since bitcoin could drop really really low which could trigger another very ugly possibility - miners abandoning bitcoin for bitcoin cash. My advice, if you own bitcoins, also buy an equal number of bitcoin cash to be on the safe side! This formation is very common in the crypto world as almost all coins went through this formation as a trigger for a huge jump in price. Of all the first three scenarios above, this I find the least likely because of the well pronounced reversed double shoulders mentioned above. However, if this turns out to be true, then we are in for a very very huge increase in bitcoin - 50k to 100k - before the next major correction. 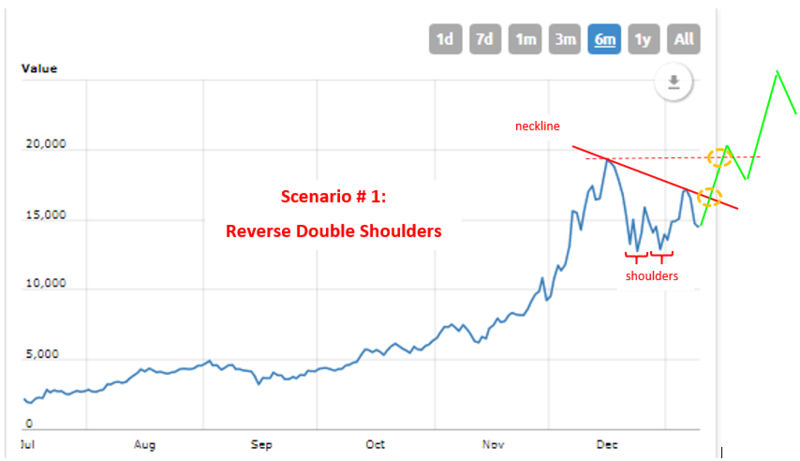 Similar to scenario # 1 above, it needs to punch through the neckline and then the ATH to confirm the very bullish trend. 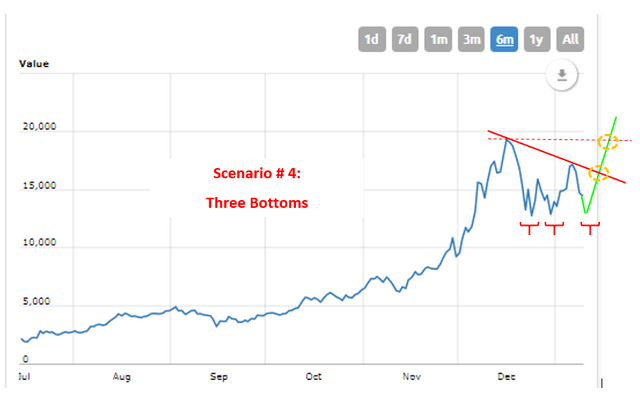 There are three bullish scenarios versus one. The BULL seems to be in control, but the very bearish scenario should not be ignored. Remember in which side all the major banks (which the bitcoin revolution wants to eliminated) are on this battle. Disclosure: This post does not intend to provide investment nor does it represents that the securities or services discussed are suitable for any investor. Investors are advised not to rely on any information contained in the article in the process of making a fully informed investment decision. IF YOU LIKE THIS POST – UPVOTETHINK OTHERS WILL LIKE IT - RESTEEMSOMETHING TO ADD - COMMENTWANT TO SEE MORE - FOLLOW. There will always be a battle with the traditional monetary system vs. the new currency system ... at end of day, one will win out. that would have been nicer. I could retire early. Thank you for the analysis, I have seen in another video that according to trends in the last 2 years for bitcoin a 100k run in the first half of 2018 is very possible. In other words , anything is possible and usually is. But you got a nice presentation to argue all scenarios. Whatever happens I still believe in crypto, and my top are Bitcoin, Etherium, Litecoin, got to have love for bitcoin cash, but dash and EOS have been holding their own. as well as others. This post has received gratitude of 6.26 % from @appreciator thanks to: @sandalphon. You got a 1.71% upvote from @upme requested by: @sandalphon.